New Fender Chairman Very Handsome! Pictured is William "Bill" Mendello, new Chairman of the Board at Fender. He replaces recently deceased Bill Schulz, the man who regained possession of Fender from CBS on behalf of the Fender employees. 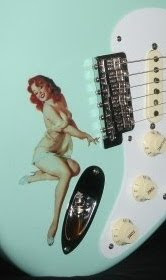 Mendello has been associated with Fender since the 70's and a senior executive since the 90's. The title/image/footer links take you to the official press release with more details. This press release photograph has got to go! Why not a photo of Bill holding a guitarbody-- his sleeves rolled up and a little sawdust on his shirt? What would be wrong with that? Instead, they gotta make him look like a GM or IBM stiff. I like all those old Leo Fender pics holding a soldering gun, winding pickups, wearing the magnifier visor... that salty old stuff! That's for me! Now, you take Bob Taylor over at Taylor Guitars. Bob knows casual; he's got his sleeves rolled up, and you know that Taylor ain't no little ma & pa geeetar shop either. Nope! But you don't see Bob Taylor puttin' on the Donald Trump groove-apparel. Since I'm a nice guy at heart, I'm givin' Bill Mendello a halloween benefit of the doubt since it's October and all. Mendello's mechanical engineering degree qualifies him for a little dirt under his nails! So I say congrats for the promotion but, BILL! LOOSEN UP, DUDE! I won't be getting goodies from these guys anytime this century.